Are you searching for replacement windows in Pensacola, Florida, or a surrounding city? If so, then look no further. Majors Home Improvement has been providing area homeowners with professional services and quality products for many years, and we will be proud to work with you for your window installation project. Our windows are custom manufactured, which means that they can be made especially for you, crafted to exactly fit your home’s measurements for a seamless look. Our Majors Select™ Vinyl Windows are made to operate effortlessly in all weather conditions, and they come with a variety of features that set them apart from other house windows on the market today. These features include welded frames and sashes, which form an impenetrable barrier against air and water; multiple chambers, which reduce outside noises and enhance energy efficiency; and interlocking meeting rails, which add security and structural integrity to the frames. Plus, their frames are made of vinyl, so you can count on our replacement windows to resist rusting, cracking, rotting, fading, and peeling. Additionally, if you’re looking to replace the entry doors at your residence, too, this is a service our expert installers can easily complete while they are replacing your windows. 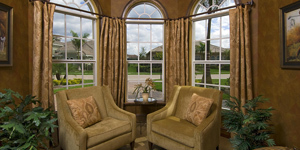 To learn more about our replacement windows for Pensacola, FL, area homeowners, contact Majors Home Improvement today. We’ll be happy to set up a design consultation at your home.